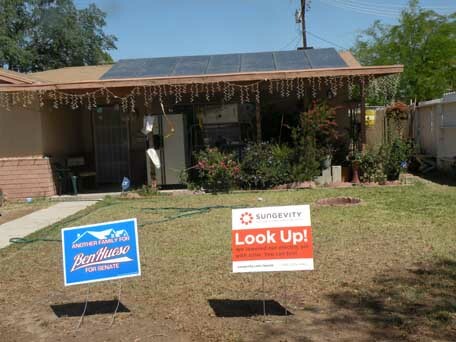 Dr. Sam Milham, MD, MPH recently conducted electrical testing at a California home outfitted with a solar energy system. Testing was conducted using a Fluke 199 dual-channel scopemeter and a STETZERiZER Microsurge Meter (modified to display readings in excess of 2,000 GS units). He emailed his results to Stetzer Electric. Microsurge Readings: 1,400 to 2,200 GS units! This house has serious electrical pollution caused by the solar inverter. I find the same pattern in every solar residence or business I have measured. I recommend deploying Stetzer capacitive filters to short out the high frequency electrical pollution in the house wiring. Also get rid of CFLs, and the DECT cordless telephone, other sources of electrical pollution. I’d strongly recommend leaving the inverter off until the pollution can be cleaned up.